Browsing the archives for the philip jose farmer tag. Ric Croxton and Art Sippo interviewed Worlds of Philip José Farmer 1: Protean Dimensions contributors: Win Scott Eckert, Christopher Paul Carey, Paul Spiteri, Michael Croteau (and surprise guest Laura Wilkes Carey) on Book Cave Podcast 85. The interview runs for just over two hours and covers many topics of interest to Philip José Farmer fans. 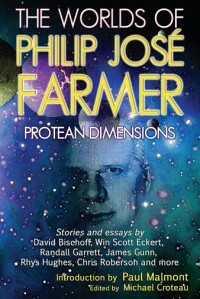 From the history of the FarmerCons to Farmerphile: The Magazine of Philip José Farmer, to meeting Phil and Bette Farmer, to collaborating with Phil, to Wold Newton, to the Magic Filing Cabinet, to different versions of Phil’s works, to The Worlds of Philip José Farmer 1: Protean Dimensions and much, much more. The Book Cave podcasts about comics, pulps, science fiction, and everything in between are always interesting, and Meteor House is grateful they ran such a long interview with us.